ANN ARBOR, Mich. — Much like dinosaurs having feathers, the fact that ancient Roman statuary was tricked out in bright paint colors is a truth difficult to digest for those of us accustomed to seeing austere unfinished marble in museums (like thinking of dinosaurs as fearsome mega-lizards rather than angry chickens). But Ancient Color, a new exhibition at University of Michigan’s Kelsey Museum of Archaeology, dives deep into the material and application of pigment in ancient Rome, and in doing so highlights a colorful, international history. 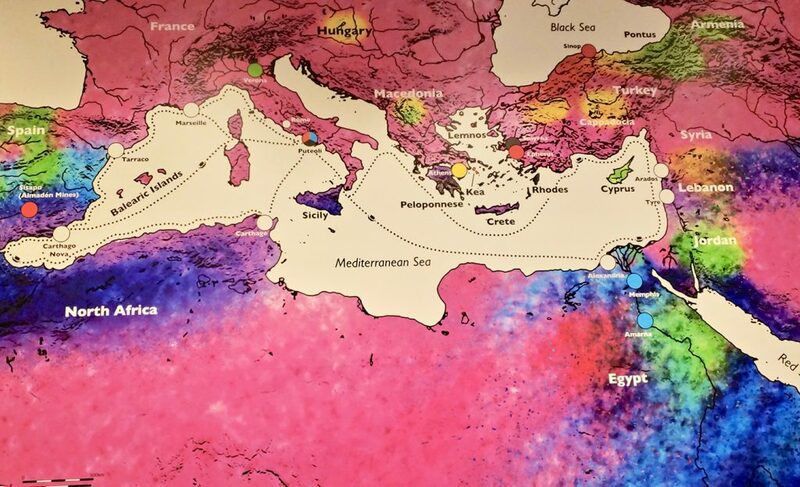 The Kelsey Museum focuses on the archeology of the Mediterranean world, with artifacts from Egypt, North Africa, the Middle East, Italy, and Greece. Their collections span prehistoric times, the Roman Empire (which comprises the largest number of artifacts) and reaches into into 13th and 14th centuries of the common era. More than half of the original collection came from early excavations sponsored by the University of Michigan at Karanis in Egypt, where the university operated from 1924 to 1935. Much of this labor was done at the behest of the museum’s namesake, Professor Francis Kelsey, who taught Latin, and wanted to bring materials to his students that represented the people they were learning about — mostly from Greek and Latin texts.